A map of the targeting strategy showing the selectable markers, arm lengths, and deletion length. The map should clearly indicate the linearization site. Arrange a meeting with us to discuss the targeting strategy. We will provide you with ES cell DNA. An autoradiogram of a genomic Southern of ES cell genomic DNA cut with your diagnostic enzyme and probed with your external probe. For targeting vectors with loxP sites, sequencing of the loxP sites in the targeting vector to show that they will be functional. 500 micrograms of super-coiled targeting vector DNA at 2 mg/ml in TE. We will verify the vector, linearize it, and clean it up for transfection. We will electroporate R1 (129) or C2 (C57BL/6) ES cells with your targeting construct and select drug-resistant cells. For a generic targeting strategy like that depicted above, we will do two electroporations. From this we will pick two 96 well plates of cell lines in duplicate, one for DNA and one for freezing. Cell line DNA will be provided in 96 well plates to be digested with restriction enzymes directly. It is expected that about 170 cell lines will grow, retain stem cell properties, and give a signal on Southern blots. You will cut the DNA and perform Southern blots to identify targeted lines. This must be completed promptly (~2 weeks) after receipt of the DNA to ensure recovery of cell lines. We will thaw, expand and refreeze targeted lines, prepare genomic DNA and count chromosomes. We monitor the cell culture, electroporation and targeting through analysis of the frequencies of single and double drug resistant colonies, and the morphology of the cells. However, because of the extreme variability of targeting frequencies (from 1 in 4 to undetectable with similar constructs), we cannot guarantee targeting or provide relief from billing. If all parameters are within the recommended limits and targeting does not occur, the best recourse is to build a new targeting vector and begin again. We ask that you acknowledge contributions of the Case Transgenic and Targeting Facility in seminars and publications. From the start date of gene targeting, it will be a minimum of 5 weeks before the first set of cell line DNAs is provided, and a minimum of 3 weeks after positive targeting events have been identified by Southern blotting before we will deliver the second set of DNAs for confirmation of the selected, targeted lines. Currently (4/24/19), the core is beginning gene targeting immediately after order placement. During this immediately interval, the core receives, cuts and purifies the targeting construct for electroporation, reviews the detection strategy and grows ES cells and feeders for electroporation. The core generates an average of about 5 gene targeted cell lines per construct. 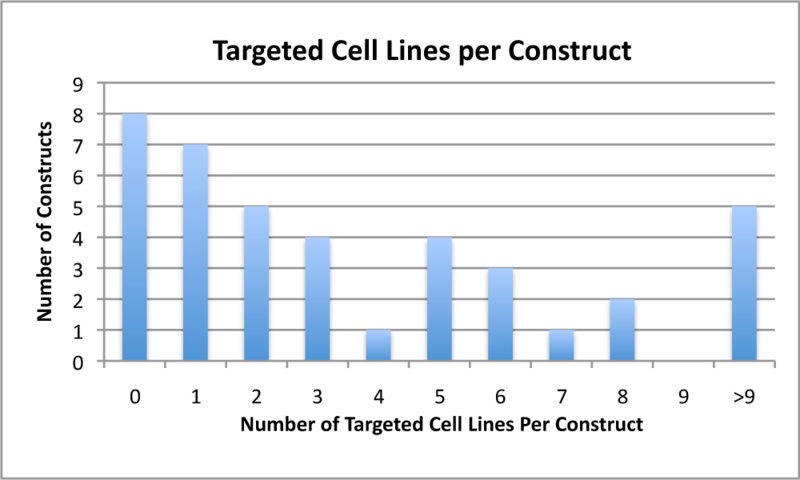 About 82% of targeting constructs generate at least one gene targeted cell line. In gene targeting, homologous recombination is used to inactivate a gene in ES cells. An ES cell line is an embryonic stem cell line isolated from a preimplantation mouse embryo. When ES cells are injected into a host embryo, they contribute to the formation of an adult mouse. The extremely rare recombination events of gene targeting can be selected from large numbers of ES cells through the use of genes conferring drug resistance and sensitivity. What about knockins, targeted point mutations and conditional knockouts? For all gene targeting, you must be able to verify that targeting has occurred correctly by Southern blot analysis with probes external to the two ends of the targeting vector, but this is particularly important for knockins, targeted point mutations and conditional alleles. In addition, verification that the targeting vector is exactly as you expect should be verified by sequencing of critical regions, such as coding sequences in knockins, and loxP sites in conditional alleles. For conditional alleles, we would like you to demonstrate that all the loxP sites are functional. We provide detailed information about the design of gene targeting vectors. In the past, most ES cell lines used in gene targeting had the 129 inbred genetic background. If a mutation on the C57BL/6 background was desired, the mutant allele generated in a 129 cell line, once established in the germ line, was crossed multiple times to C57BL/6J mice to establish it on that strain. This converted the majority of the genome not linked to the allele to the C57BL/6J background. Unfortunately, C57BL/6J ES cells are not genetically stable in culture and thus do not transmit well from chimeras. However, it has been found that ES cells on the related C57BL/6N background are reasonably stable and will transmit through the germline. C57BL/6N mice arose from C57BL/6J in 1951. About 30,000 sequence differences have been found between C57BL/6J and C57BL/6N by whole genome sequencing (Mekada et al., 2009, Zurita et al., 2010, Keane et al., 2011). While this is a large number of differences, it is about 100 fold less than the number of differences between 129 and C57BL/6 strains. It should be noted that C57BL/6N carries a retinal degeneration mutation in Crb1 which causes significant impairment of vision (Mattapallil et al., 2012). The transgenic core can target the C57BL/6NTac cell line C2. Mutants targeted in C2 can either be maintained on C57BL/6NTac by crossing chimeras to mice purchased from Taconic, or can be crossed to C57BL/6J mice purchased from The Jackson Laboratory. What can be done to ensure success? Typically, one wants to ensure that no protein is made from the targeted gene. Therefore, construct a vector to delete as much coding sequence and as many functional parts of the protein as possible. However, there is a practical limit to the amount of DNA that can be deleted by targeting: gene targeting frequency decreases with deletions greater than 10 kb. Include as much homologous DNA as possible: the greater the amount of homologous DNA, the greater the possibility that targeting will have a reasonable frequency. At a minimum, no arm should be less than 1 kb and the two arms together should total more than 7 kb. The more homologous DNA you use, the better. Construct your vector with genomic DNA from the same strain of mice as the ES cell line. Small differences in DNA sequence can have very large effects on targeting frequency. 129 genomic clones in BAC vectors (.pdf) for targeting the R1 cell line can be purchased from the Sanger Institute. BACs containing your gene can be identified using the ensembl genome browser, selecting the DAS source "129S7/AB2.2 clones". If you wish to obtain a specific clone, clicking on the BAC will bring up a menu, and selecting the link at the bottom of the list will take you to the order form. C57BL6J genomic DNA BAC clones for targeting the C2 cell line can be identified with the UC Santa Cruz genome browser and purchased from BACPAC Resources Center CHORI. Alternatively, DNA from the "wrong" strain can be used to construct targeting vectors if there are no differences in sequence--single nucleotide polymorphisms (SNPs) are distributed in a mosaic pattern in mouse strains, with blocks of high sequence difference separated by blocks of identical or nearly identical sequence. The locations of sequence differences for your region of interest can be ascertained here on the Jax web site. Although we know many of the parameters that affect gene targeting frequency, we clearly do not understand all. Targeting vectors with small differences (e.g. the pieces selected for the arms of homology or the orientation of the selection cassette) targeted to the same gene can have very different targeting frequencies. Moreover, it can be difficult and time-consuming to build constructs for gene targeting. Given the uncertainty of whether targeting will occur at all, think twice before investing a lot of time in building a complex, kitchen-sink vector. It would be better to invest effort in designing multiple simple vectors. Additional information about the design of targeting vectors has been excerpted and modified from LePage and Conlon, Methods Mol Med 2006. In order to verify if gene targeting occurred, and in order for us to begin the gene targeting process, you must have developed a proven strategy to determine if gene targeting occurred. You will need a probe that is not contained in the targeting vector that will distinguish the targeted from the wild type allele. Do not use enzymes that contain CpG's as these are frequently methylated in ES cell DNA. We require that you have demonstrated that your probe and digest work on a Southern blot of ES cell DNA. The frozen lines in 96 well plates have a limited life span, which does not allow sufficient time for you to work out your detection strategy after the fact. If the Southern blots identify targeted lines, those cell lines will be thawed, expanded, their chromosomes counted and DNA will be prepared for further verification of the targeting event. Because locally duplicated sequences can result from targeted insertion, targeting should be verified with an probe outside the targeting vector on the other side. Additional information about the detection of targeting events has been excerpted and modified from LePage and Conlon, Methods Mol Med 2006. Why were there no targeting events? It is not clear why some vectors target and others do not. If your vector is within the parameters given above, choosing different pieces to construct a second vector is recommended, although there is little guidance that we can provide beyond recommending that the amount of homologous DNA be increased. Moving the arms to different parts of the gene, and flipping the orientation of the selection cassette sometimes help. It is better to invest your time in building a second vector than to screen more cell lines with a vector that doesn't target at an appreciable frequency.